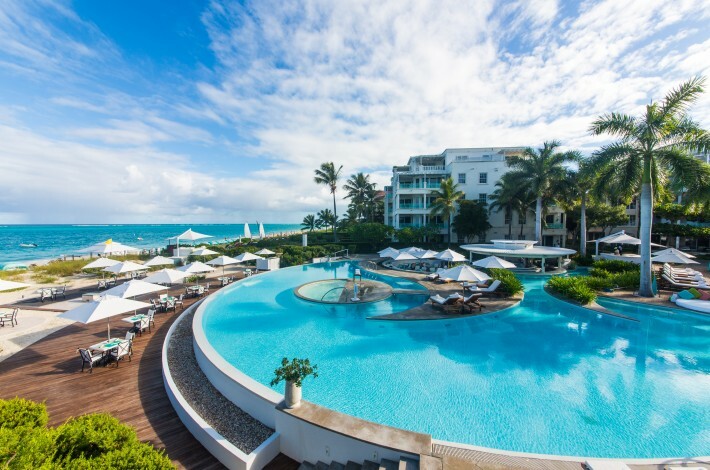 Head to Turks and Caicos for simple island pleasures in the most gorgeous of settings. 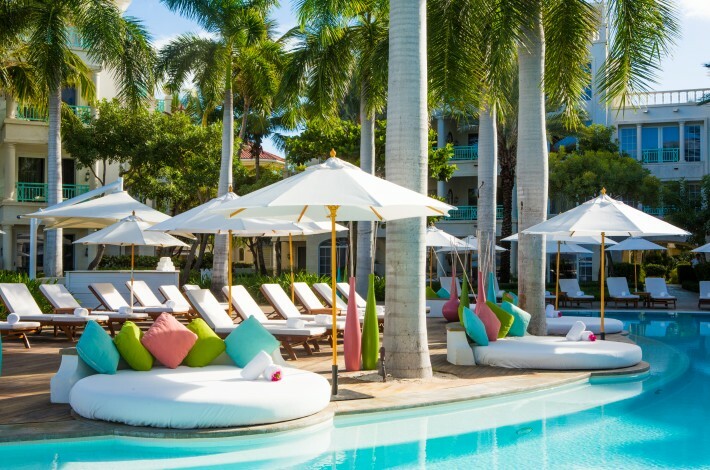 Nestled in the British West Indies, just 600 miles southeast of Miami, The Regent Palms beckons sophisticated travelers to Providenciales Island in the Turks and Caicos. With a rarified mix of idyllic setting, contemporary indulgence and simple island pleasures, few places are as amazing as the island’s white sand beaches, turquoise waters and friendly locals. This is a spot where tourists can feel safe exploring anywhere. On the pristine shores of Grace Bay, buildings made of hand-cut coral stone and fragrant gardens meet the pure, soft white sands. 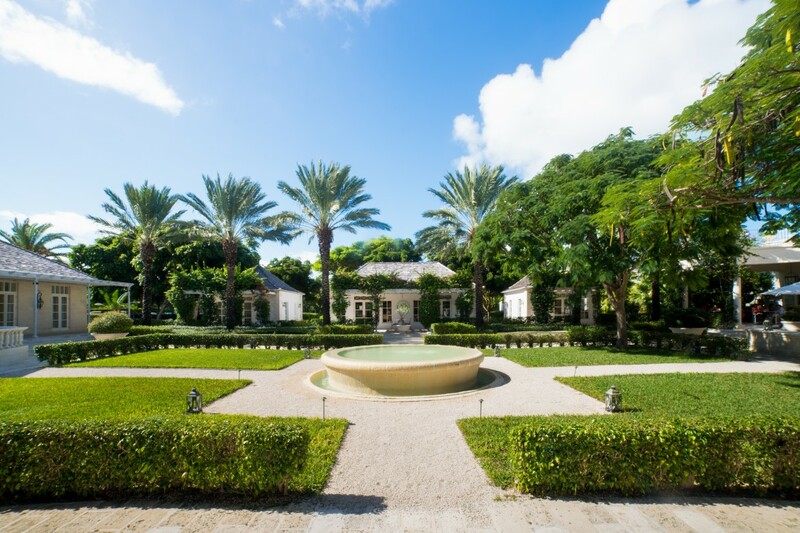 Regent Palms is home to 72 suites, including one-, two- and three-bedroom accommodations with impeccable rooms, baths and kitchens that recall the traditions of a huge mansion. That’s just the beginning, as Regent Palms also features an infinity pool, art gallery, fashion boutiques and award-winning restaurants. The service at this resort is flawless as well. Whether you come for a solo getaway, family vacation, girls’ weekend or rejuvenating romantic retreat, you won’t be sorry. At the internationally acclaimed Spa Regent Palms, 25,000 square feet house reflecting pools, an outdoor meditation area and 14 freestanding hand-cut coral stone treatment rooms. Their newly launched spa menu offers results-orientated treatments inspired by Eastern and Western rituals to heal the body, rest the mind and soothe the soul. We’ve culled a list of our spa treatment musts, so make sure you book one of these during your stay. 1. Zareeba: Quiet your mind and body in a Zarreeba (a small enclosed room), as you’re presented with a pot filled with a blend of fresh brewed therapeutic herbs flown in from Jamaica. Blend the herbs yourself with the wand provided so you control the intensity and amount of herbal steam. A cool-down wrap and lymphatic massage follows for a balanced sense of well-being. 2. Detox Seaweed Leaf Bath: This bath utilizes organic, hand-harvested seaweed to moisturize your skin, increase circulation and promote healing. Or choose the Asian Bath Ritual, which includes a blend of ultra-hydrating natural sea salts mixed with your favorite body elixir; cool compress eye pillows allow you to drift away during this experience. 3. Mother of Pearl: A blend of hand-crushed local queen conch shells is mixed with your choice of aromatherapy oils and then applied to skin for an invigorating body polish. Extend this experience with the addition of a massage or Vichy shower. 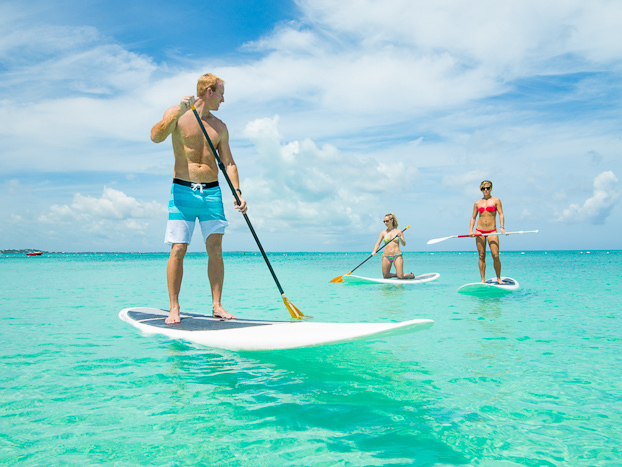 You’ll find an abundance of activities nearby, including kayaking, paddleboarding, sailing lessons, tennis, banana boating, horseback riding on the beach, golf at Provo Golf Club and kite-surfing. Head to the fitness studio for full cardio and weight equipment, or try some of the classes such as Pilates, body sculpting, boot camp or yoga. Other on-island activities include fishing, diving, exploring on beach buggies and even wake-surfing. Turks and Caicos is filled with amazing dining locations. 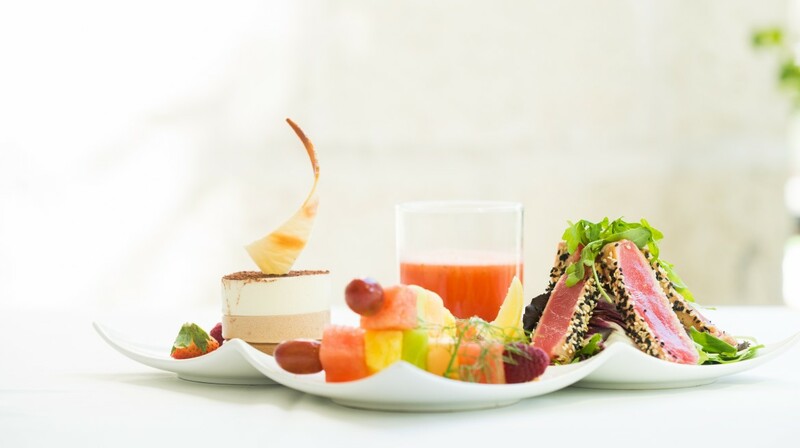 If you don’t want to leave the resort, simply walk over to Parallel 23, which serves breakfast, lunch and dinner. You’ll find outstanding fusion fare that combines international and Caribbean flavors. Enjoy your meal on the bougainvillea-covered outdoor terrace overlooking the resort’s gardens. 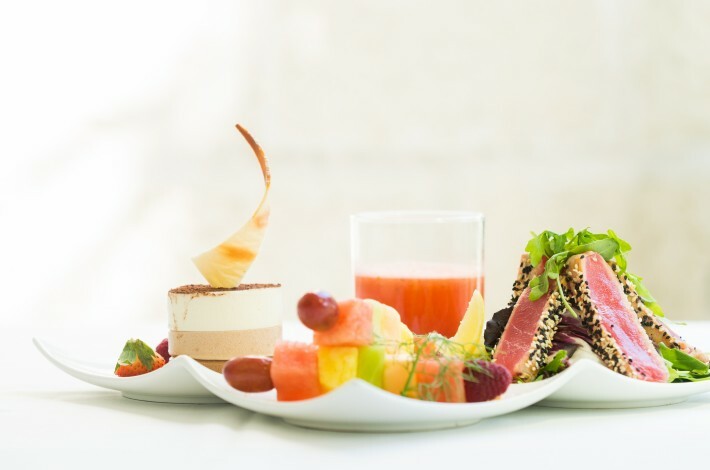 Plunge serves Caribbean and Mediterrean flavors for lunch and dinner and American favorites from the wood-burning oven—along with light salads and sandwiches—located next to the infinity pool. Try the Conch Ceviche with Plantain Chips or Greek Salad paired with any of their inventive cocktails. Be sure to stop by local haunt Spice Gourmet, too, for beer, wine and gluten-free delicacies. If you’re on the island on a Thursday, be sure to head to the Island Fish Fry for the best in Turks and Caicos food selections. This weekly beach festival is accompanied by great music and vendors selling homemade jewelry and crafts. Be sure to try the Conch Fritters, Cracked Conch and Conch Macaroni and Cheese. Here are some other dining favorites. Somewhere Café and Lounge—Fabulous beachside atmosphere with incredible margaritas and nachos served along white sandy beaches. Coco Bistro—Over-the-top hip outdoor dining. All of the food is delicious, but don’t miss the avocado-and-lobster rolls with Thai mango salsa and sweet chili salad, or spicy lobster tacos with fresh guacamole, sour cream and pineapple tomato salsa. Salt Bar & Grill—Enjoy the casual and fun outdoor atmosphere with seating overlooking the marina. You can also play beach volleyball or check out the horseshoe pit. For great nightlife, head to Ganzaevoort on Friday nights for dancing to fabulous music.